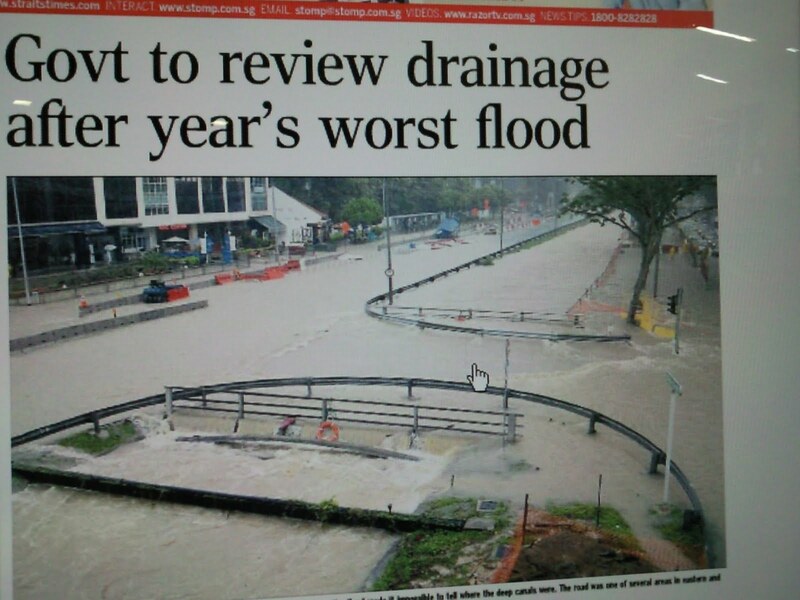 I was shocked to read about the flood in Orchard Road again? Still stunned at the image i took a camera shot at NTU's Library Samsung LCD Tv. I thought my eyes are seeing things, how could a country like Singapore be flooded like the image below??? Looks like more of us have to take out not only swimming lessons but also life saving skills. News Story: "THE Government is relooking Singapore's drainage systems and building codes in the wake of the year's worst flood. On Sunday, an intense bout of rainfall washed out retailers in Tanglin Mall and caused a traffic snarl along Bukit Timah Road. At a press conference following the floods, national water agency PUB's chief executive Khoo Teng Chye said the flood was the result of intense rain over central Singapore. Over a period of five hours between 6am to 11pm, Singapore saw 124mm of rain, including 65mm that fell within just 30 minutes. The day's deluge, 77 per cent of the average monthly rainfall for June, was responsible for the floods, said Mr Khoo. Last year's June 16 Orchard Road floods were caused by 100mm of rain that fell over two hours. In that incident, clogged drains were also a contributing factor."